If you’re looking for a crib that is affordable, has a good value, and can be used as a secondary sleep area, the Graco Pack ‘n Play On The Go Playard would be a perfect fit. The spacious design allows for great play and sleeping room and allows the crib to grow with your child. An included bassinet and toy bar also help baby feel more at home. In the end, the On the Go Playard is a great purchase that will be a durable and affordable option for your family. If you’re looking for an affordable pack and play for your child but still want all the great features, the Graco Pack ‘n Play On The Go Playard might be a great option! Graco has many different models of pack and plays available, but the Graco Pack ‘n Play On The Go Playard is one of their top sellers. This is more of a standard pack and play and is perfect for families that might not use their travel crib often, so are looking for a less expensive option. It also boasts a durable frame that stands up to heavy use and repeated travel. While it has all the required safety features for pack and plays, there aren’t any known additional features that make the On the Go Playard extra safe. Many baby gear companies go through additional independent testing and certification to ensure that their products meet top safety standards for fabrics used and design. Graco does claim that the Graco Pack ‘n Play On The Go Playard does use phthalate-free materials, so this is better than nothing! It also boasts a durable frame that stands up to heavy use and repeated travel. A metal rod support system makes the construction durable and safe. There is no weight limit for the playard and is usable until your kiddo is 35 inches tall or is able to climb out on their own (which is a safety standard all pack and plays must follow). There are a few features included with the Graco Pack ‘n Play On The Go Playard that make it a comfy choice for your baby. 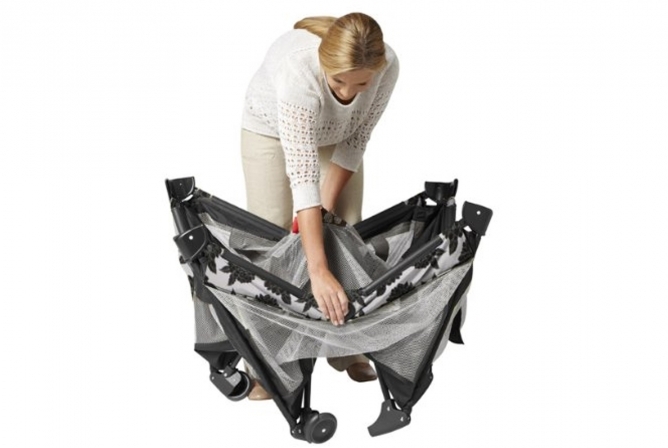 It comes with a full-sized and removable bassinet that attaches to the top of the frame. The mattress pad for the playard is the same mattress used for the bassinet, which is a great convenience factor. There is a 15-pound weight limit with the bassinet, and it might be a wise rule to follow as many parents claim that the mattress tends to bow in the middle after a bit of use. The mattress is also on the harder side, something to keep in might when purchasing sheets or possible padding for this playard. Included with the Graco Pack ‘n Play On The Go Playard is a toy bar with soft toys and enough interior room to play and sleep. Airy mesh walls are included on all sides for maximum ventilation. This safety and comfort feature also allows baby to visualize everything happening around them, making them feel included and at home in this pack and play. Included with the Graco Pack ‘n Play On The Go Playard is a toy bar with soft toys and enough interior room to play and sleep. The roomy interior allows for a great play area, but also enough sleeping room for wild sleepers and also for growing with your child. The toy bar adds to the fun for your little one, allowing for visual stimulation and play especially while using the bassinet. The Graco Pack ‘n Play On The Go Playard doesn’t have a lot of accessories or cumbersome pieces to assemble. However, it’s still one of the more difficult pack and plays to assemble and take down that we’ve reviewed. One really nice feature that helps with setting up is that the instructions are included on the back of the mattress pad for quick reference and also are included in the user manual. With a bigger size than most pack and plays, the Graco Pack ‘n Play On The Go Playard is still simple enough to travel with if needed. It comes with a travel bag that is machine washable but can be a little bulky to carry and pack into a car. Unfolded dimension are pretty standard at 40 inches x 28.5 inches x 29 inches (LxWxH). It features automatic folding feet and wheels which allow for a smaller and more compact fold. 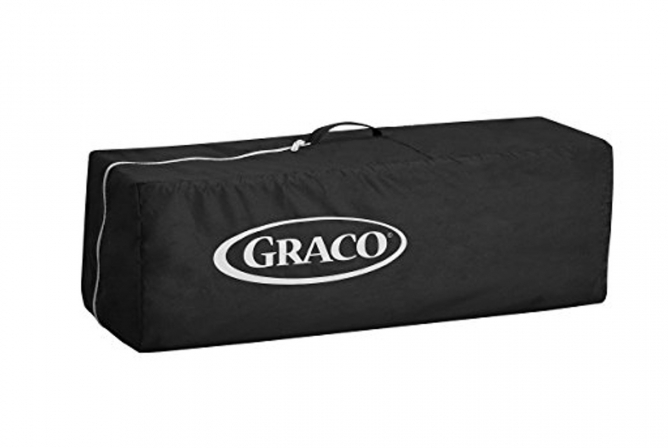 However, the Graco On The Go weighs in around 23 pounds, making it heavier than other pack and plays and possibly more difficult for frequent travelers. It features automatic folding feet and wheels which allow for a smaller and more compact fold. There are quite a few features that make the Graco Pack ‘n Play On The Go Playard easy to use, but other features that are lacking as well. Many Graco pack and plays feature a “push-button fold,” but don’t really make the playards easier to disassemble. Assembly and disassembly both require the manual locking and unlocking of the rails and support joints. The tedious assembly and disassembly might require a little more time and patience from users. Assembly and disassembly both require the manual locking and unlocking of the rails and support joints. The included bassinet is also a little more complicated to set up. The internal support poles need to be properly fitted together before being able to attach it to the top frame of the crib. This adds to the safety factor for extra support but also takes a little more time to set up. Included with the Graco Pack ‘n Play On The Go Playard are storage units that can be attached to the sides of the crib. This helps to keep wipes, diapers, and other essentials easy to access without cluttering up the rest of your room. It also features easy, wipe-clean fabrics that make easy clean-up simple. Included with the Graco Pack ‘n Play On The Go Playard are storage units that can be attached to the sides of the crib. Although the Graco Pack ‘n Play On The Go Playard doesn’t come with a crib sheet, you can pretty much use any fitted crib sheet with the mattress. 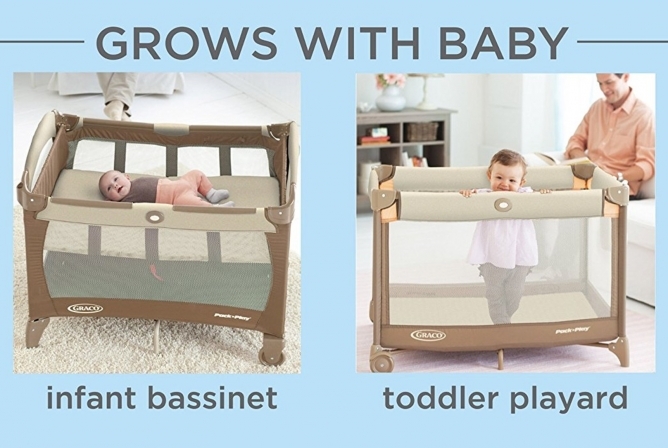 Some pack and plays require you to buy the crib sheet that goes with their crib and then charge a lot of money for it, but that’s not the case with the On the Go Playard. Many parents find that American Baby Company’s fitted portable crib sheet and quilted mattress cover fit perfectly with the Graco On the Go Playard. All materials (besides the travel crib) are spot clean only with a mild soap, which can be difficult for bigger messes. Due to the fact that there is no weight limit with the playard and the bigger overall dimensions, the Graco Pack ‘n Play On The Go Playard has the potential to last for a few years until your kiddo reaches the 35-inch height limit. The durable construction and mess-free fabrics also make this a product that will stand the test of time. 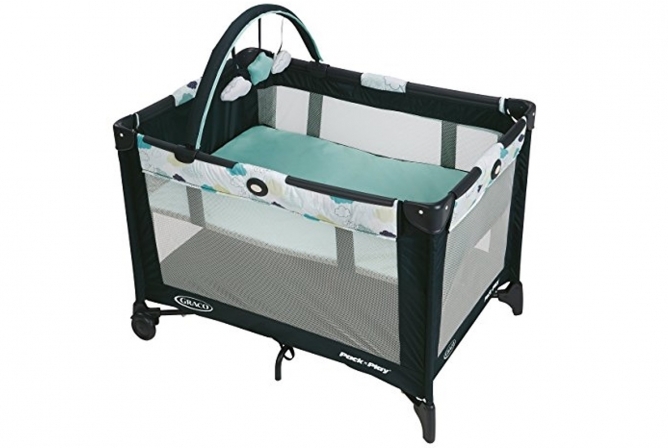 The price for the Graco Pack ‘n Play On The Go Playard is what makes this crib appealing for many parents. While it lacks in other areas, you get a great playard with great features for a very reasonable price. Graco is a solid baby product company that produces safe and durable baby gear, so they are a very trusted brand for many parents. The price for the Graco Pack ‘n Play On The Go Playard is what makes this crib appealing for many parents. This pack and play doesn’t come with a mattress sheet, so purchasing an extra sheet, and possibly some padding for the thin mattress, adds to the cost of this portable crib. Otherwise, there really aren’t many other pack and plays on the market that can beat this price for the included features and durable design by Graco. The Graco Pack ‘n Play On The Go Playard is a great choice for families who are looking to keep a stationary pack and play, like at home in the living room for play or for grandma and grandpa’s house. The design is difficult to set up and take down, while also on the bulky and heavy side. This would make it difficult to transport for frequent travelers. If you’re looking for a crib that is affordable, has a good value, and can be used as a secondary sleep area, the Graco Pack ‘n Play On The Go Playard would be a perfect fit. For those looking for a higher end pack and play with more quality materials, convenient travel size, and unique features then take a peek at a few other pack and plays on the market (like these ones that we’ve also reviewed). In the end, the On the Go Playard is a great purchase that will be a durable and affordable option for your family.